Brightly coloured with appealing imagery, M&Ms has released their newest installment of in-store display promotions. This POS display unit advertises their products in Carrefour supermarket through large characters holding up the chocolate for all to see. M&Ms are internationally recognized chocolate brand. They are produced and manufactured by Mars Incorporated. For many years, M&Ms advertising has featured personified characters of their different flavors of chocolate. This makes for engaging content and is great for merchandise and promotions. 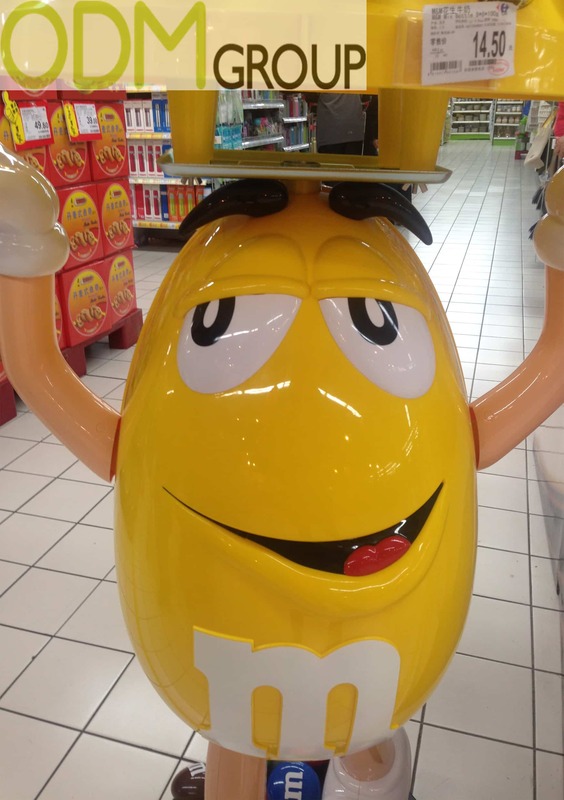 Towering above the neighboring in-store displays, the featured M&M promotion interacts with the customers. The brand directly aligns its products and branding at eye level. As a result, this creates a desire to check out the products as the sweets literally dangle in front of them. The comical character Yellow works for both children and adults. Therefore, making the first point of contact with the in-store display humorous and fun. This display promotes to all age groups. The variety of custom packaging is a powerful tool. This is able to make a traditional supermarket staple appear fresh and new to consumers. This display works in conjunction with M&Ms advertising promotions. Customers will recognize the yellow M&M from commercials, increasing interest in this display. The bright colors, large logo, and iconic characters promote brand recognition and retention. From afar, anyone will instantly recognize the brand. As a result, there will be increased brand retention. You can customize your POS display any way you want. Choose from different materials: wood, cardboard, plastic, etc. ODM will find something that fits your taste and budget. For M&M, large colourful in-store displays are very effective and useful for brand promotion. Custom POP displays spark the interest of your consumers as well as new potential clients. Furthermore, this could also impact the brand’s image and product quality. Here at ODMasia, we have a talented and friendly team of creatives on hand to help develop your retail display options and propel them into a successful campaign. So don’t hesitate, contact ODM today to customize your own in store display! 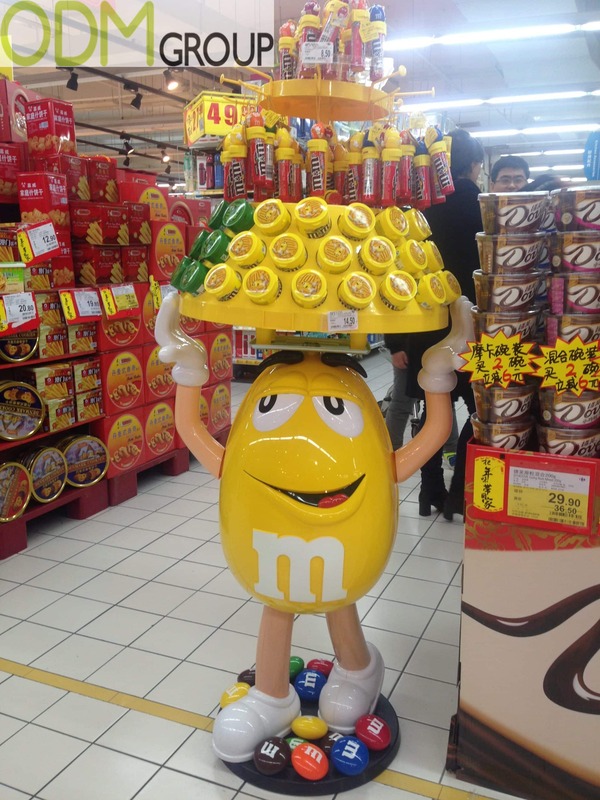 M&M’s summer promo in France is bright, bold, and has great shelf appeal. M&M’s promotional candies dispenser is a practical gift option. Relax in comfort and style with M&M pillow gift with purchase: placing these items in your home supplements M&M’s brand presence. Ferrero is a market leader in producing unique promotional displays; this one is no different. Dove’s packaging design is sure to appeal to young children – don’t underestimate pester power. Kinder’s display conveys a lot of information. Shoppers will stop and stare at this promotional item.